Bananas, Pillsbury Crescent Sheets, Nutella, and cute googly eyes all combine for this deliciously frightening Halloween delight. A perfect make-ahead treat, too! Roll out crescent sheet to about 10-11 x 6-8 inches. Slice into 6 equal squares. Lightly score each square in 3 equal sections, vertically (without cutting through the dough). Using a knife, cut horizontal strips about 1/4 inch wide down each side section. Spoon a couple of tablespoons of nutella down the middles section, leaving about 1/2 inch on both the top and bottom and place a slice of banana on top. Fold the right two cut sections over the head and then then alternate right and then left, leaving a small space for the eye section. Bake at 375 until golden brown, probably about 12-15 minutes. Remove from pan and let cool to room temperature. 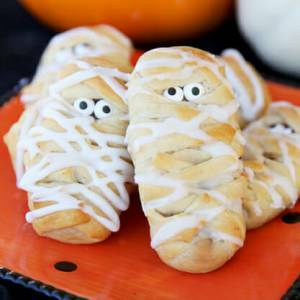 Mix powdered sugar with enough milk or water to form a glaze and then lightly drizzle it over the mummies. Let it dry to the touch and then serve. Makes 6.